The International Space Station (ISS) was in position to view the umbral (ground) shadow cast by the Moon as it moved between the Sun and the Earth during the solar eclipse on March 29, 2006. 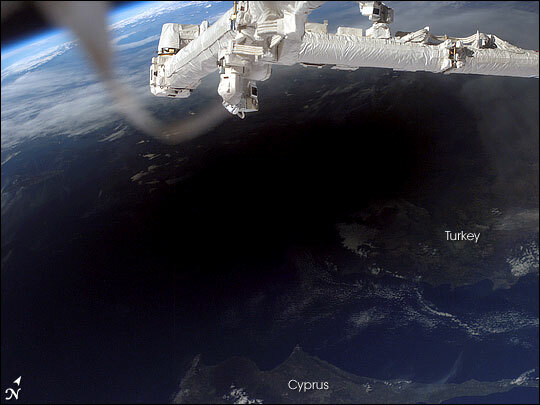 This astronaut image captures the umbral shadow across southern Turkey, northern Cyprus, and the Mediterranean Sea. People living in these regions observed a total solar eclipse, in which the Moon completely covers the Sun’s disk. The astronaut photograph was taken at approximately 2:00 p.m. local time. The terminator of the eclipse—the line between the light and dark parts of the Sun’s disk— is visible as it passes across central Turkey. This total solar eclipse was the fourth to have occurred since 1999. The portion of the ISS visible at image top is the Space Station Remote Manipulator System. Astronaut photograph ISS012-E-21351 was acquired March 29, 2006, with a Kodak 760C digital camera using a 35 mm lens, and is provided by the ISS Crew Earth Observations experiment and the Image Science & Analysis Group, Johnson Space Center. The image in this article has been enhanced to improve contrast, and lens artifacts have been removed. The International Space Station Program supports the laboratory to help astronauts take pictures of Earth that will be of the greatest value to scientists and the public, and to make those images freely available on the Internet. Additional images taken by astronauts and cosmonauts can be viewed at the NASA/JSC Gateway to Astronaut Photography of Earth. 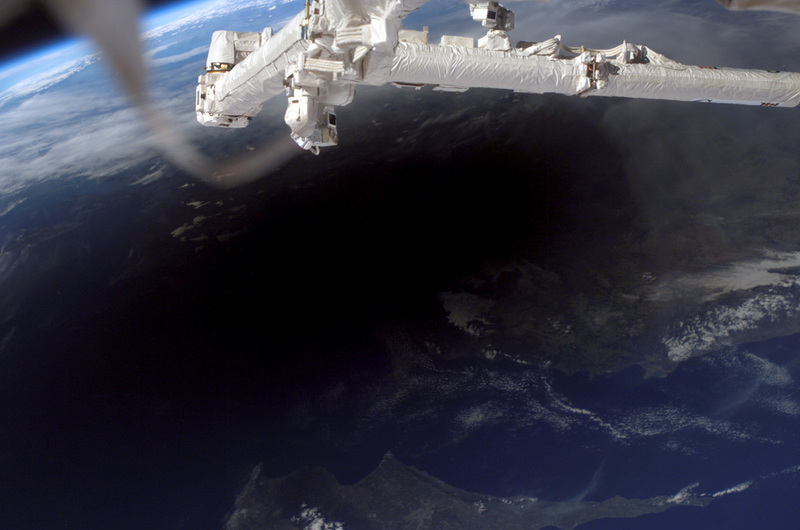 The International Space Station (ISS) was in position to view the umbral shadow cast by the Moon as it moved between the Sun and the Earth during the solar eclipse on March 29, 2006. This astronaut image captures the shadow across southern Turkey, northern Cyprus, and the Mediterranean Sea. People living in these regions observed a total solar eclipse, in which the Moon completely covers the Sun’s disk. The astronaut photograph was taken at approximately 2:00 p.m. local time. The terminator of the eclipse—the line between the light and dark parts of the Sun’s disk— is visible as it passes across central Turkey. The portion of the ISS visible at image top is the Space Station Remote Manipulator System. A total solar eclipse swept across Africa and the eastern Mediterranean Sea on March 29, 2006.